There is a gemmological quirk that affects up to a third of diamonds – when exposed to UV lights, they glow. This intriguing colour play – diamonds most often shine neon blue, but can also emit yellow, green or orange colours – has traditionally been considered a flaw, reducing the price of highly fluorescent diamonds by up to a quarter. Yet at the Louisa Guinness Gallery in London, jewellery designer Cora Sheibani’s latest collection Glow is celebrating fluorescence with a fascinating collection of glow-in-the-dark jewels. 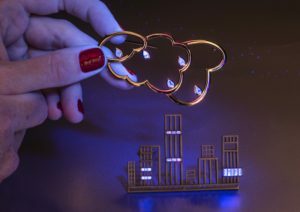 Small boxes are pinned to the walls of the Louisa Guinness Gallery, at the heart of London’s Mayfair, with temptingly clickable UV torches poking out the top of the installations. 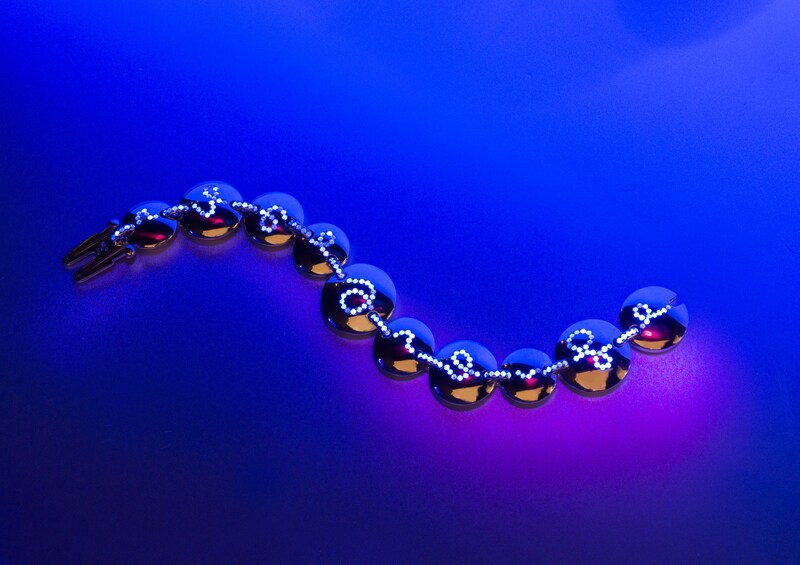 Within them, Cora Sheibani Glowjewels are displayed in all their glory, shining out luminously under the blue lights. Clicking the end of the torch will cancel the UV light flow, and the diamonds and gems revert to an entirely different state. Diamonds are once again white, fluorescent rubies – the collection also uses naturally glowing coloured gemstones such as rubies, spinels and sapphires – return to red. In the far corner of the room, a darkened nook beckons you in, with a peek-a-boo display that encourages you to look through cut-out shapes that give you a view of glowing jewels within. Set up in subaqueous-like displays on glistening rocks and crystals, one feels transported to the bottom of the ocean, where strange bioluminescent creatures electrify the darkness. “Fluorescence and phosphorescence are a significant characteristic of certain gems, a quality that is often overlooked but I believe should be used as a design feature,” says Sheibani, who was born in Switzerland but now runs her jewellery brand from London. Indeed, a quick test used by jewellers to determine whether a ruby is from Burma is to shine a UV light on the gem to see if it glows. Sheibani has spent a year gathering together enough highly fluorescent gemstones to create the jewellery in Glow. While gemstone grading laboratory GIA claims that between 25% and 35% of all diamonds present fluorescence, the strength of the natural phenomena can vary. Only 10% of such fluorescent gems would be graded as having ‘medium’, ‘strong’ or ‘very strong’ fluorescence, making the type of highly fluorescent diamonds Shebani needed for this collection very rare. The playful nature of Glow is further extended by the whimsical designs that Shebani has chosen to light up with fluorescent gems. Glow-in-the-dark diamonds, rubies, spinels and sapphires are worked into rings inspired by cupcakes, brooches that take the form of rain clouds or cityscapes, bracelets that pay homage to cactus plants. All of the Cora Sheibani Glow jewels play on the concept of day-to-night jewellery, with the diamonds and gems offering a classic look during the day, and then lighting up when under UV lights – making them perfect jewels to wear to an evening event. Their transformation remains a secret, revealed only at their owner’s discretion, or by a rogue strobe light. 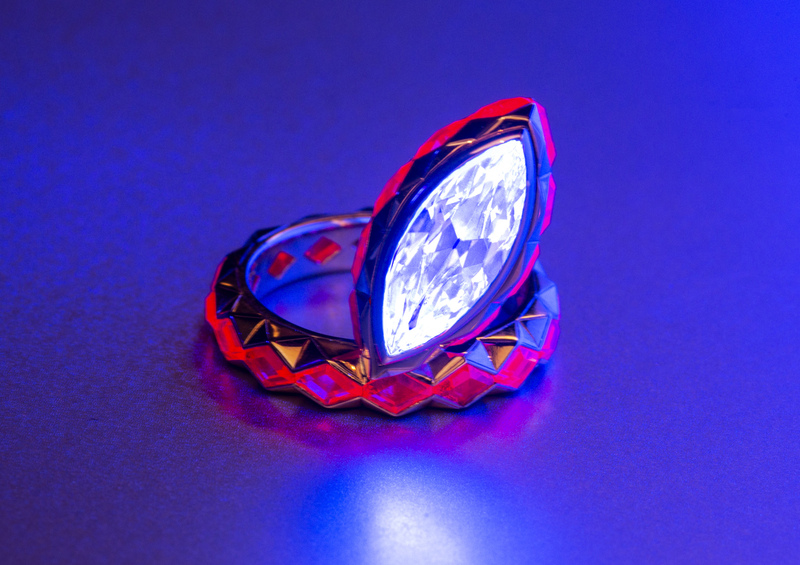 Glow by Cora Sheibani: Jewels with Fluorescence is on display at the Louisa Guinness Gallery in London until April 30th, 2019. The show will also pop up at the Colnaghi Gallery in New York from May 18th to 23rd, 2019.